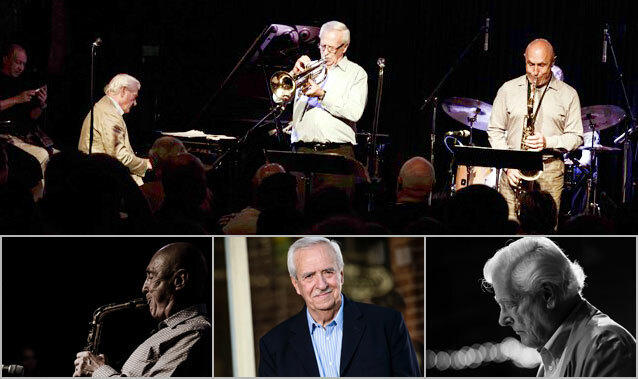 This group brings together some of the most influential and successful jazz musicians in the country, led by trumpeter Al Muirhead and featuring pianist Tommy Banks and saxophonist P.J. Perry. The group is rounded out with Jeremy Coates on bass and Tyler Hornby on drums. Jeremy and Tyler are not only a large part of the Calgary jazz scene but they have both traveled extensively, performing around the world. This is the second time they are performing for us as they performed two years ago at the Festival with Jens Lindamen’s group Brassfire as part of their North American tour. Tommy Banks needs no introduction. Not only is Tommy a great pianist, he has also been a successful conductor, arranger, composer, television personality, and former senator. He was the musical director for the Commonwealth Games, Expo 86, The World University Games and the XV Olympic Winter Games in Calgary. He is the recipient of the JUNO Award, the Gemini Award, and the Grand Prix du Disques Canada, and is a member of the Alberta Order of Excellence and an Officer of the Order of Canada. Over the years Tommy has been a great influence in music and music education throughout Canada. “Tommy Banks has done so many other things in music, and so many of them more visibly, that it’s easy to overlook the fact that he plays damn fine jazz piano” –Globe & Mail. From a Festival perspective, Tommy was a facilitator at our very first Festival 26 years ago. P.J. Perry is Canada’s premier jazz alto saxophonist. His illustrious career started at the age of 14, performing with his father’s band. He performed throughout Western Canada until 1959 when he moved to Toronto, quickly becoming a key player with the best bands in the area. After a stint of performing in Europe, P.J. returned to Canada, making Edmonton his home base. Although Perry continued to perform with groups all across Canada, the city of Edmonton and his relationship with Tommy Banks became a big part of his career. P.J. has shared the stage with great jazz legends such as Dizzy Gillespie, Woody Shaw, Rob McConnell, Joe LaBarbera, Bobby Shew, and has performed with every major symphony in Canada. JUNO Award winner and member of the Order of Canada, P.J. Perry continues to be active across North America as a studio musician, jazz soloist, concert performer, and recording artist. The Festival is excited to present such an iconic group to perform for you on the opening night of our 26th Festival.